Set in the sporting arena Poliesportiu d’Andorra, 54 FIM World Champions were welcomed to celebrate the sensational year of racing action, as the 2018 season comes to a close. Hosting all champions crowned as well as FIM Team World Champions, every motorcycling discipline was recognized. 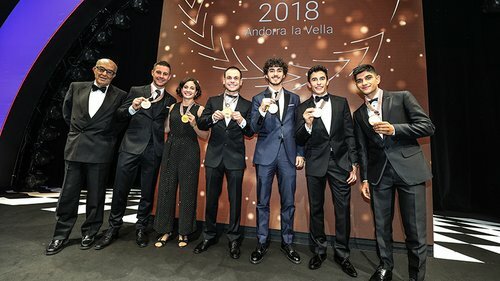 Beginning the celebrations with a signing session at Andorra Park Hotel in the Andorran hills, the champions then took to the red carpet before proudly receiving their medals in the ceremony in the arena. History-maker and 2018 MOTUL FIM Superbike World Champion Jonathan Rea (Kawasaki Racing Team WorldSBK) collected his medal – for the fourth time in a row – in front of motorcycling racing’s elite. It was not only Rea collecting his medal, he was joined by FIM Supersport World Champion Sandro Cortese (Kallio Racing) who took the title in his rookie season in the final round at Losail International Circuit. One of the most notable champions attending the awards was FIM Supersport 300 World Champion Ana Carrasco (DS Junior Team), who became the first solo female to win a world title, crowned in dramatic style at Circuit de Nevers Magny-Cours. It wasn’t only our WorldSBK champions celebrating, they were joined by MotoGP™ World Champion Marc Marquez who took his seventh world title this season, Moto2™ World Champion Francesco Bagnaia and Moto3™ World Champion Jorge Martin.